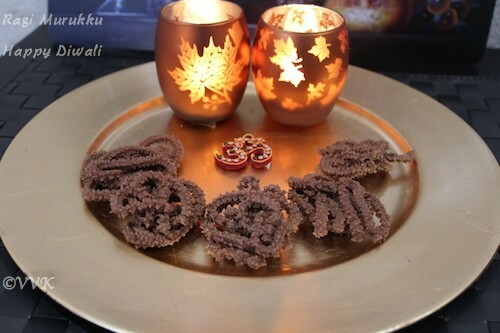 In the attempt of preparing healthy snacks I baked shankarpaara and then here is the raagi murukku. I didn’t bake it though. 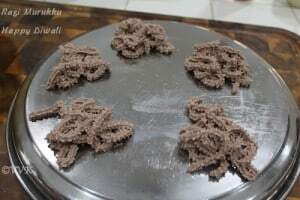 You can find the regular baked muruku recipe here but this one I went with regular frying. 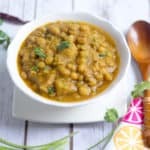 I am not sure about the calories in regular murukku and ragi murukku but I am sure the addition of ragi flour and roasted channa dal flour will add some additional vitamins and minerals for sure. 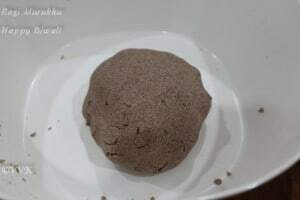 Ragi which is popularly known as finger millet, red millet is cultivated in Southern India and it’s pretty popular in Karnataka especially the Ragi mudde (ragi balls). 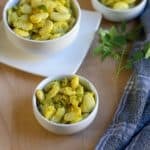 It is rich in iron and calcium. 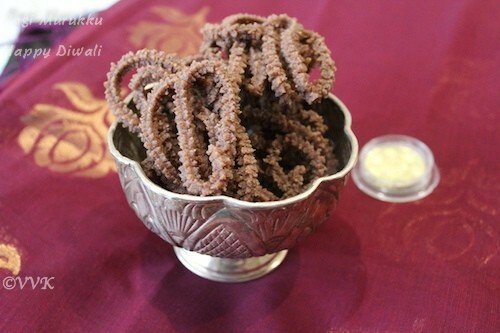 For preparing the murukku you need the presser (except for kai murukku) or as we say Naazhi in Tamil. You can use any shapes. 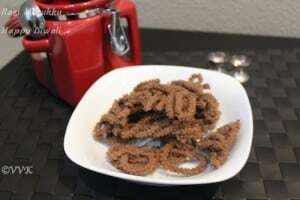 When I prepared murukku for the first time, I couldn’t press it directly in the oil. I wasn’t comfortable so I used to press the murukku in oil applied Ziploc bag or oil applied plate like below and transfer it to oil. But you might lose the shape. Eventually after many trials, I started to press directly in the hot oil. But I just wanted to share how I used to do initially. 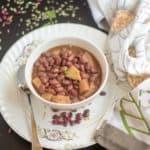 Take ½ cup of the dalia and dry grind into a fine powder. 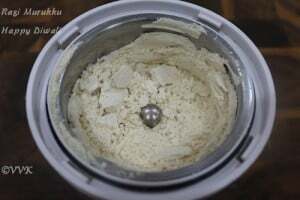 Sieve the ragi flour and rice flour. 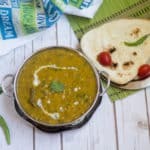 To this add the channa dhal flour. 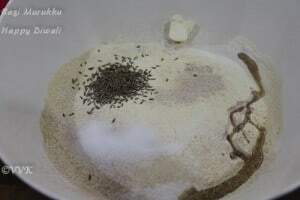 Mix these three flours well and now add the cumin seeds, hing, butter and coconut oil. Slowly add water and bring them together and prepare soft dough. It should slightly softer than the chapatti dough. Meanwhile heat the oil for frying. While the oil is getting hot grease the molds and the presser with oil and add a handful of dough inside the presser. Once the oil is hot, start pressing the murukku directly in the oil or in a separate plate and transfer it. Now it’s a do while loop. Perform the above processes until you have the dough. I usually press maximum 3 to 4 murukkus in one batch. This depends upon the kadai size. Make sure the you fry the murukku in the medium heat. 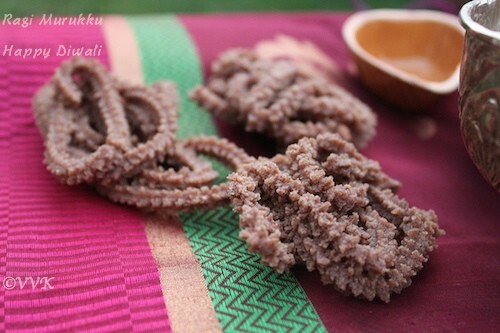 Crispy murukku and I love the ragi one..
Crispy & delicious looking ragi murukkus.